What is the most important aspect of a beginner instrument? The simple answer is playability. Young people should not be discouraged by an instrument that is difficult or impossible to manage, or they risk losing interest and choose to quit. Teachers understand this all-too-well. They see instruments every day that are not adequate for the needs of the player. You WILL find cheaper Violins on the internet. We have seen these instruments in our workshop because customers bring them in for service. These instruments always require more work that is worth spending. A teacher that is a friend of our shop, calls these things "instrument-shaped objects" because they are not truly musical instruments. 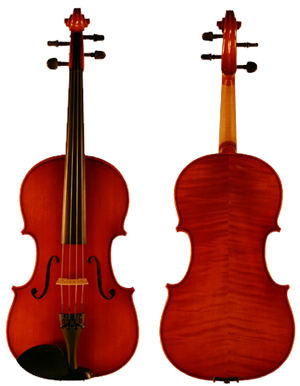 You will not find a $99 Violin on our website. Our selection starts at a level that is the minimum acceptable quality according to the vast majority of teachers, and therefore the minimum reasonable investment. 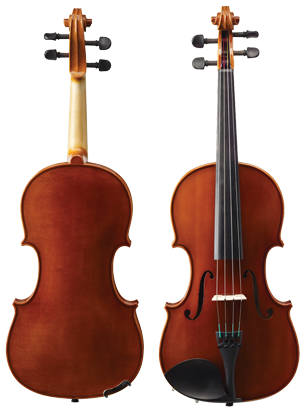 If you are serious about supporting a student's desire to succeed in music, DO NOT buy a $99 Violin off the internet. There, you just did all the research you need to do about how much to spend on a student Violin. Let us help you with advice to complete your outfit with bow, case and accessories. Email us for expert assistance. The most affordable instrument we offer. Les Etoiles means "The Stars" in French,(as in Twinkle, Twinkle). It is one of our primary rental instruments, and also a very popular choice for entry-level quality. Made for us by one of the most well-known and respected Chinese workshops. Step up, hand finished instruments from the Segue Line as high quality, entry level instruments. Made for us by one of the most well-known and respected Chinese workshops. Another high-value Chinese import, with a redder colored varnish compared to other brands. Our entry level instrument from Europe. 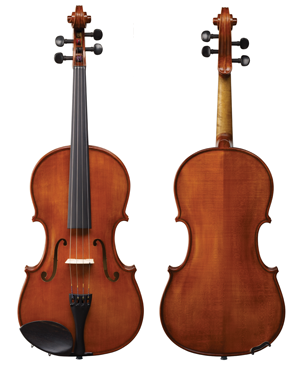 A tradition of quality workmanship, and low cost of production make these appealing instruments suitable for beginning students, schools and rental programs. Their appearance is more attractive to many customers, as compared to the brighter, cleaner appearance of Segue Concertino. Slightly flamed maple. Brown varnish with hints of golden tones. 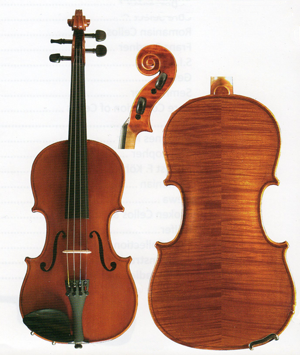 European wood is the equalizer, as far as comptitiveness with Chinese-made instruments. European production can't compete on the labor costs with China, but they can offer European wood, which can only be found in very high-end Chinese instruments. So, even an entry level European instrument has overall similar value with an entry level Chinese product. Intended for rental fleets, school music programs and other institutional uses, but offered here because of the exceptional value. As the name implies, Core is Kohr, the same well-known brand as Johannes Kohr and August Core. Same as model 20, but with upgrades in materials and varnish process.